Add class and sophistication to any room with the lovely mirrored Escanaba Accent Table from iNSPIRE Q® Bold. This three-drawer accent table features simple, clean lines that attract the eye. With black trim for intriguing contrast, this table enhances the appearance of the decorative motif of any room. With its compact 33-inch height, this table is also versatile and fits into almost any available space. Quality! Jewelry for my bedroom! Knowing this table is mostly mirror, I really took a chance ordering this. However, upon inspecting the table out of the box, which was packaged extremely well, there was not one flaw. The table is mirrored on all sides with very dark trim and drawers (3) are very smooth. The back is the same as the side and top trim which is a black or extremely dark brown finish. Looks like black to me though. This table is solid- not cheap! Goes well with my canopy bed which is a dark espresso wood, and I didn't want the matchy look, but it does coordinate. I received the shipment in 5 days!!! Oh and getting the table on sale was another plus. This is my best overstock order thus far. I'm beyond happy. Mirrors are tinted black - It is not the shiny mirror finish you see in the pictures. The craftsmanship is good but look is very 80s. Overstock will make you pay for the return. We bought 2 for night stands and they are perfect. Arrived in great condition, packed very well. Well constructed, drawers open and close easily (not cheaply put together). The only assembly is putting on the drawer handles, easy! Great buy at great price - much less expensive than others of the same quality/size. The dimensions listed in the description are the size of the shipping box that the nightstand came in, NOT the size of the actual nightstand. I'm so disappointed because I specifically bought this table because the height was listed as 33 inches which would have been perfect for what I needed the item for. The actual height is only 28 inches....5 inches less than it was advertised as which is rather considerable. Other than wrong the dimensions, I have to say the table is absolutely beautiful. Great Quality! Worth the price! This piece is awesome! I was looking for a chic nightstand to replace my boring black night stands. These night stands did the trick! 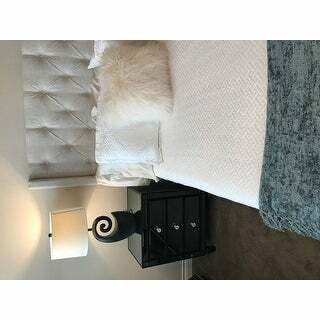 The height of the night stand is perfect for those that have a standard bed frame with box spring. The nightstand might sit a bit high for those that have beds closer to the ground... There's no assembly required aside from the knobs that need to be screwed in the drawers. For those that live in the Bay Area, the package arrived in less than 3 days. The nightstand is packed very securely. I'm very happy with my purchase! I absolutely love this mirrored accent table. its so sleek, elegant, and modern. Goes perfectly in my room! I bought two for my san and daughter-in-law. They have a black plarform bed so it was perfect but not what was expected. Nevertheless the stand is well made and came fully assembled. Love the look. It fits in nicely with my bedroom crystal chandelier. The black trim and darker tint to the mirror give it a more sophisticated look than many mirrored pieces. Just what I was hoping for! I ordered this piece for use as a nightstand. It's a sturdy piece and has held up really well since receiving it. The drawers are a good size too so I ended up being able to fit more into it than anticipated. The mirrored accents are beautiful and go well with the rest of my bedroom furniture. I love these nightstand! I feel that it completes my bedroom set. After having three of these for over a year, they all have broken. I do not recommend. looks great,very well packaged.arrived quickly in perfect shape. These are beautiful and just what I expected after reading other reviews. 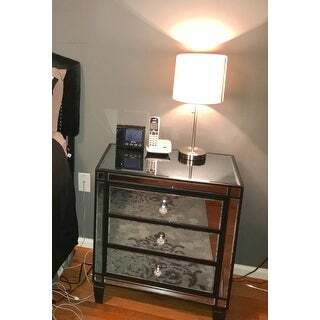 The glass is a little darker than some other glass nightstands, but it’s pretty and works well with black furniture. They were really well packed too. My daughter loved these nightstands! Excellent quality for this price! 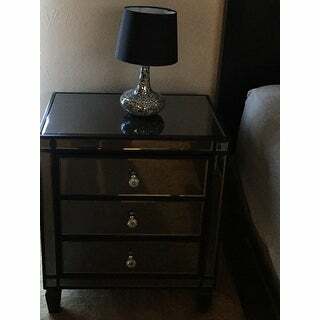 LOVE these night stands. I get so many compliments on these and they go perfect in my master bedroom. "What is the duration of the warranty? Most, if not all similar brands offer a 1 year warranty." Hello, this has a 90 day limited manufacturers warranty. "What is involved with putting it together?" Nothing :) The only thing you will have to do is take it out of the box and put on the knobs/pulls. The only assembly required is the attaching of the drawer knobs. This requires a screwdriver, which is not included. "Is this item part of a collection with a matching dresser?" The INSPIRE Q Escanaba Mirrored 3-drawer Black Trim Accent Table does not have a matching dresser. "The middle drawer is stuck and will not open at all. There's nothing in the drawer, so there's no reason for it to be stuck. I can't open it even a bit. How do I fix this? 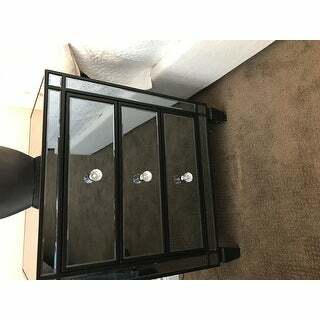 I can't figure out how to remove the top or bottom drawers. Please help. " I have never had any issues and I have two chests. The drawers are on sliders. If you look on the side of the sliders when you extend the drawer, you should be able to pinch on side in the slider and the other side push. This should allow you to remove the drawer. Since you cannot open the middle drawer, I would suggest trying this on the top drawer, removing it, and then see if you can find what is blocking the middle drawer. "Two people asked the question as to the height of the table. One answer says 28" and the other says 33". Also a customer review says its 28". Which is it?" The INSPIRE Q Escanaba Mirrored 3-drawer Black Trim Accent Table dimensions are as follows: 27.88 inches high x 23.63 inches wide x 15.75 inches deep. We are currently working on correcting the information shown onsite. We apologize for the inconvenience . "Do the legs come off so I could make it shorter if I wanted to?" The feet cannot be removed. "Is the black tint as dark as shown in pictures 2 and 3? or is it more subtle as shown in pictures 1 and 4?" The INSPIRE Q Escanaba Mirrored 3-drawer Black Trim Accent Table has minimal to no tint on the mirrors. The appearance of this item can differ due to the lighting and background for each image. Black furniture is sleek, beautiful, and bold. With the right pieces, you can dress your living room up or down and achieve a look that feels like home. Whether you want a look that’s swanky and sophisticated or fun and casual, here are some tips for decorating your living room with black furniture. Decorating a nightstand is the perfect opportunity to add to the style and functionality of your bedroom in a few simple steps. Lighting and furniture make a huge impact on the look and feel of your space. Check out our guide to perfectly pairing your lamps and end tables. Double the decor with dual-level coffee table that's both stylish and functional. Follow these helpful tips to perfectly style your two-tier coffee table in no time. A nightstand is an essential piece of bedroom furniture that makes a stylish and functional addition to the side of your bed. These bedside tables serve multiple purposes, such as providing convenient storage within arm’s reach of your bed and bringing balance to your room’s arrangement.